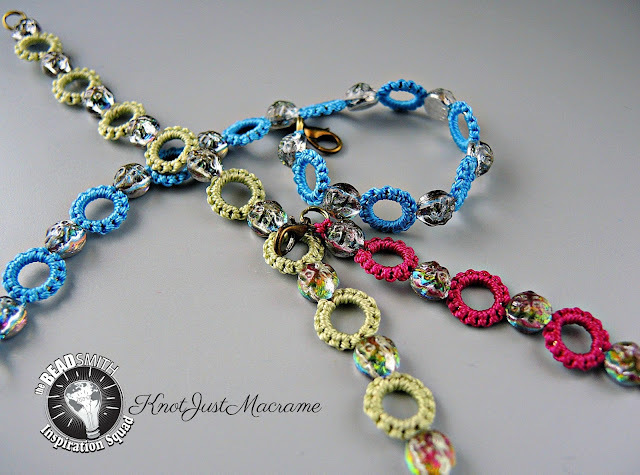 Knot Just Macrame by Sherri Stokey: New Stuff! Ta da! I finally get to show off one of my new micro macrame bracelet designs using new beads from the Beadsmith! You don't know how hard it is for me to keep my mouth shut when I'm excited about something. I swear, it's physical pain. I'm not much of a "hold it in" kind of person; I'm more of a "wear it on my face" and "shout it from the rooftops" kinda gal. Anyway, the sadistic folks over at the Beadsmith sent me these Baroque Cabochons back in November (yes, that's November) and then wouldn't let me share until now (I'm typing that in my best whiny, self-pitying voice). 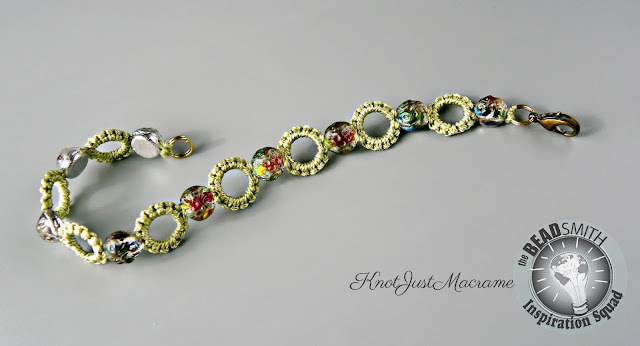 The Baroque Cab beads have two holes running parallel through them which makes them perfect for a design like this because they don't flip over when the bracelet is worn. Oh, and I learned something, too. I thought cabochons (cabs) were undrilled (no holes) but they are polished instead of faceted. These are definitely not faceted - the surface is roughly dimpled which makes the backlit coloring in these appear very different in different light or with different colors. The three bracelets in the photo above are all done with the very same beads, but they pick up some color from the cord. 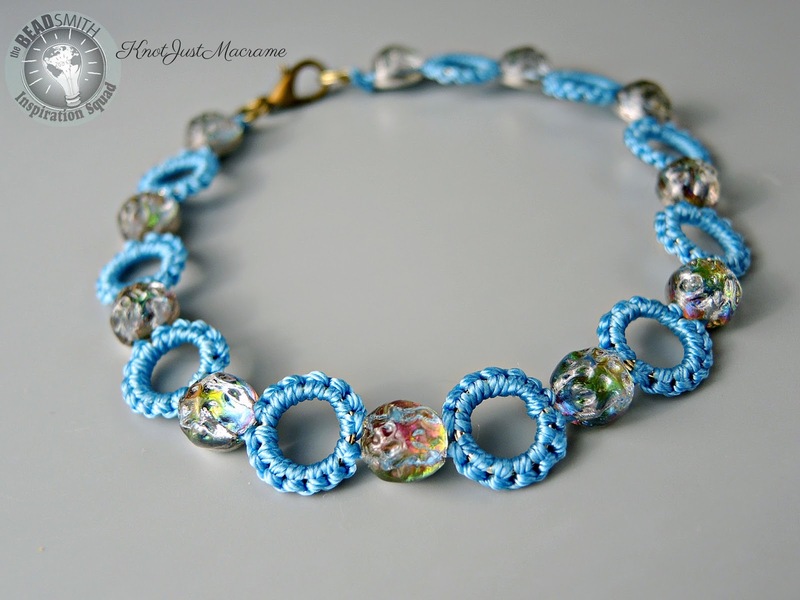 The knotted sections between the beads look like tatting but they're actually done with macrame - lark's head knots. 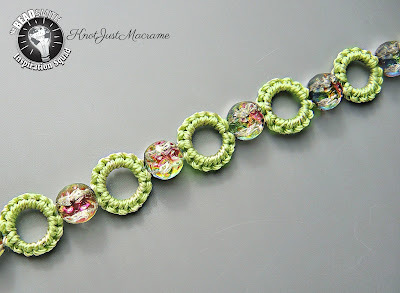 I like how the empty space in the macrame sections mirrors the shape of the beads. Something about that is just very satisfying. Anyhow... I still have another design I can't show you yet because I used super secret beads, but at least I got to get this one out there! Whew! That's a load off! I'll be back in a few days to unveil the other piece (I hope). See you soon! No it is not bragging or shameful, just wonderful. I am so proud of you. This bracelet is gorgeous and so are the others you have made. As I said, you are back and doing great. I think it is amazing and you should be sharing it with the world. How awesome is that to have them use your gorgeous jewelry. WTG!! !